The Vauxhall Motors company was founded by Alexander Wilson in 1857, and specialized in the development of equipment for ships. However with the advent of the automobile it became interested in this new direction in engineering and in 1903 it constructed its first example of a four-wheel vehicle. Until 1910 its principal activity was the marketing of sports cars; but the outbreak of war in 1914 radically changed the industrial profile of many firms, including Vauxhall. Even before the war Vauxhall had developed the C2 type, which had excellent characteristics for its time and received its own informal name, the 'Prince Henry'. For military needs the design was slightly simplified, and a less powerful engine was installed. The updated design was named the D-Type. From 1912 to 1922, more than 1,500 cars of this type were built. They were widely used as staff cars on every battlefield - on the Western Front, in East Africa, Palestine and even on the Russian Front. 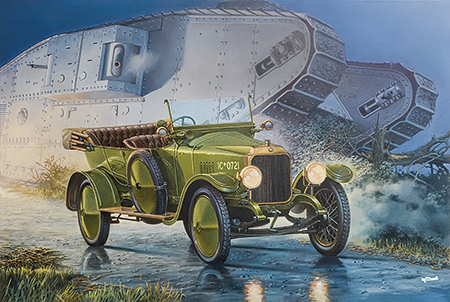 One of these cars was in the personal garage of the King of Great Britain, George the Fifth, and he made an inspection trip to troops on the Western Front in this car immediately after signing the Armistice in November, 1918. This car became something of a legend in Great Britain. The leading newspaper of that time, the 'Morning Post', in its military review noted that the Vauxhall was the most acceptable car design for the headquarters requirements of his Majesty's armed forces. Vauxhall D-Type, Western Front, unknown unit, 1917. Restored car is exhibited nowadays. Vauxhall D-Type, Western Front, unknown unit, 1917. Vauxhall D-Type, personal car of His Majesty King George V, Western Front, France, November 1918.